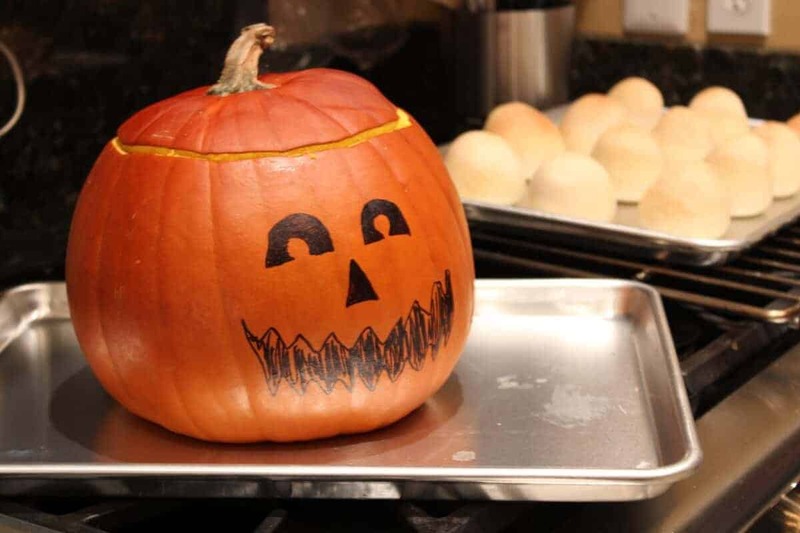 How to Make Dinner in a Pumpkin- An Easy Halloween Tradition - So Festive! Free New Year’s Eve Countdown Bag Printables! Simple New Year’s Party Ideas! 12 Days of Valentines For Your Spouse! Your Guide to a Stress-Free Easter! 7 Simple Birthday Tradition Ideas You’ll Love! The Birthday Shoe- A Magical Birthday Tradition! Stressed about Easter? Get our 30-Page Easter Planner & Printables to help! 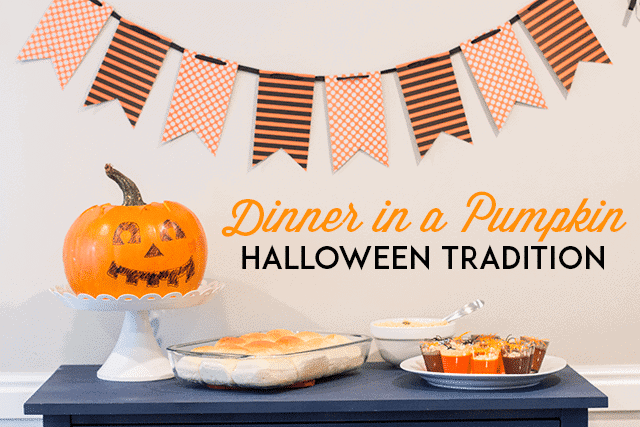 Make this simple dinner in a pumpkin recipe for a fun family Halloween activity. *This post may contain affiliate links. For more info, check out our Privacy & Disclosure Policy. 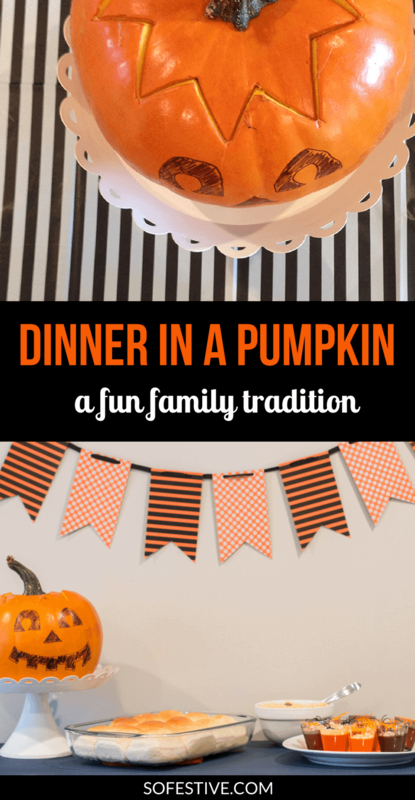 A few years ago, we were the lucky dinner guests of a good friend who let us be a part of one of her family’s favorite Halloween tradition: Making Dinner in a Pumpkin. I had always wanted to try making dinner in a pumpkin, but it seemed way to complicated. Until I learned from my friend that it was actually quite easy. Even if you are not a gourmet cook, making dinner in a pumpkin is simple and delicious. There are just a few steps to follow and before you know it, you’ll have a festive dinner for your family or friends. Pick out a medium-size pumpkin. You’ll want to be sure to get one that will fit in your oven! Clean out the pumpkin, removing all seeds as best you can. Draw a Jack-O-Lantern face on the outside with permanent black marker. Place on a large cookie sheet— this is the one we use! Brown the meat and onions, and then combine all the rest of the ingredients. Place the dinner mixture into the pumpkin and bake. Make your entire dinner festive by serving these sides with your dinner in a pumpkin. Cut off the top of the pumpkin and thoroughly clean out the seeds and pulp. Paint a Jack-O-Lantern face with a permanent marker. In a large fry pan, saute onions with ground beef until browned. Drain any fat. Add in soy sauce, brown sugar, mushrooms, and soup. Simmer 10 minutes, stirring occasionally. Add in cooked rice and water chestnuts. Spoon the mixture into the pumpkin shell. Replace pumpkin top and place entire filled pumpkin on a baking sheet. Bake 1 hour or until meat of the pumpkin is tender. Put pumpkin on a platter to serve. 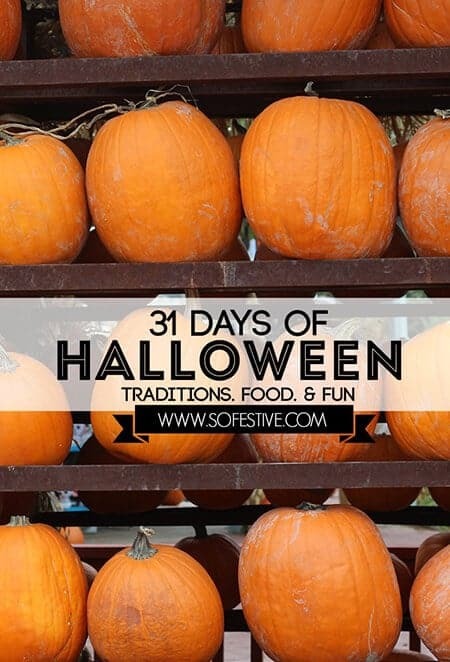 Be sure to tag your dinner in a pumpkin on social media with @sofestive and #celebratesimpler. I’d love to feature you! Melissa loves simply celebrating life through holidays, travel, photography, and the simple moments at home. Her best friend Brandon and her are raising their 4 adorable little ones just north of Salt Lake City, UT. Sunshine, gelato, a good run, planning a trip, and an organized house make her really happy. She loves sharing simple ideas to inspire everyone to celebrate life. Simply. 8 Tips for an Awesome Caramel Apple Bar! Hi! Do you use a baking pumpkin and eat the pumpkin flesh with the meat filling, too? Excited to try this! Yes, a small baking pumpkin or regular carving pumpkin. Just make sure it will fit in your oven! And yes, we eat the pumpkin flesh with the mixture! WANT FREE STUFF? JOIN OUR FUN CLUB! How to Make a Newborn Survival Kit for a Baby Shower Gift!